Kierra is the blogger behind the personal and honest fashion blog A Pretty Thought and spends her days working in the denim industry. She has an overwhelming love for the Holy Grail fabric of the 21st Century and has all your answers for any denim questions you could possibly have. Anything specific you want to know about jeans? Don't know which style or cut to get? Confused about the care and keeping of a particular pair you have? Read the article she wrote specifically for A Glamorous Revelation below for everything you need to know about finding the perfect jeans for you and comment below with any extra questions you have or visit her blog APrettyThought.org and see if you can find the answer in any of the posts she has on her website. Make sure to check out the next installment of my Blogger Confessions series "Monetizing Your Blog" on her blog for the 3 things to think about before you decide to monetize as a small blogger. Enjoy! I grew up wearing Levi jeans, overalls, and any other denim item you could possibly think of; and when I graduated college with my BS in Apparel Merchandising it only seemed fitting that I work in Denim. So with my current experience (Men’s sales at Hudson Jeans) and my long childhood history, I have learned a few tricks of the trade. Wash: If the fabric is weak that means that pretty red color that just made you love it so much, will soon fade if not handled properly. My recommendation: Don’t wash it. Fit: Ever wonder why at forever 21 you’re a size 8 and at charlotte russe you’re a size 10? Its usually a difference in fabrics (along with construction), but typically a jean will be easier to get into if it has more stretch. How do you know what fabric you’re using? Check the tag and see the percentage of cotton and spandex. Try and get a pair of jeans with at least 2% spandex. If you’re shopping premium denim, the specialist in the store will definitely be able to tell you which jean to get based on your needs. Example One: I want a pair of jeans I can wear into, something that will fit me perfectly over time. Answer: Raw denim will start off stiff but will eventually shape to your body. Answer: Stretch denim, fits like a glove, works easily around your body. Fun fact: Most rip and repair jeans cost upward of $150 because of the time needed for manual construction. First the garment has to be ripped and then it has to be sewn and tightened around the edges; sometimes there is even a backing (this is the repair portion). If you’ve never been measured go to any denim store and have them measure you (I got measured at Buckle) or try on various inseams and see where they fall. I’m 5’9 and my inseam is 34 (long). Inseams are your guide to determining which fit to buy. Which leads to my next point! Fun tip: If you can’t find the right length and fit then pic length first and have it tailored to the fit you want. For example I just bought the Rip and Repair jeans (see below) and I love them but I don’t like bootcuts. So I had it tapered at the knee all the way down into a skinny. Now you have the perfect length and fit! Managing different types of jeans: I know there are some who prefer not to wash jeans at all but for those of us who do. Rip and repair jeans: Need to be hand washed, If you stick them in the washer you take the risk of getting them snagged on something. Wax/coating: Most all jeans have some type of coating or hand sanding but waxed denim is trending for fall and holiday. If you wash these the wax will come off. I would suggest not washing them at all, even hand washing. Printed jeans: Hand wash or wash inside out with like colors. The last thing you want is for your print to fade! All other jeans: Wash inside out with like colors! All of the above pants are Hudson Jeans. I currently own the first two! If you have any questions feel free to ask! To hear more from Kierra visit her blog A Pretty Thought and follow her on Bloglovin'! First of all, for those of you who are unfamiliar with the amazingly whimsical shoe designer Sophia Webster and her namesake label visit her website now and meet me back here in 10 minutes when you're done drooling. Okay! Now that everyone is up to speed I can keep going. If you have been reading my blog for even a little while you're probably familiar with my overwhelming love for Sophia Webster. 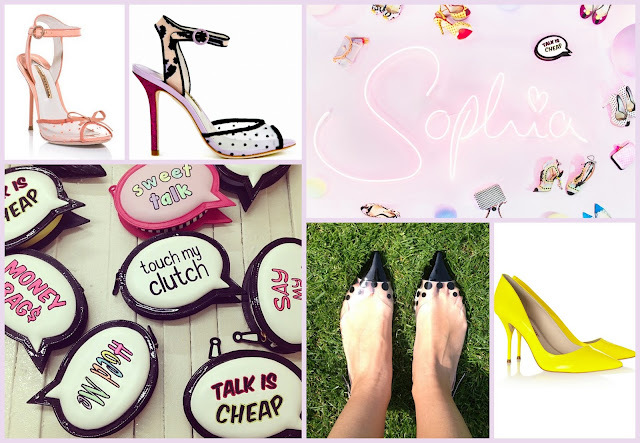 At least one pair of her shoes are on my Rich Girl Wishlist, my "Shoes" Pinterest board is full of her designs, and I almost cried when she announced the 2014 Sophia Webster summer sale. But Sophia Webster isn't the only brand that has amazing designs that look like they've been covered in unicorn kisses. Some of my favorite accessories brands have the same quirky fairytale motive at heart and have prices accessible for the average Glamour Girl without sacrificing the quirky or cool aesthetic. Nila Anthony bags come in so many different prints, shapes, and materials and you can browse all of them on their website. They have bags made out of metallic, holographic, cork, and transparent plastic fabric. They also have bags shaped like watermelon, limes, ice cream cones, stars, and eyeballs as well as reinterpreted versions of classics like satchels and hobo bags. I love Love LOVE April's necklaces! My absolute favorite is the "Hot Air Balloon necklace", with the "Rain Cloud" pendant coming in second, and the Wizard Of Oz-esqu "Country Cottage" necklace coming in a close third. She also has a necklace and earring set with a toadstool pendant, a pair of bicycle earrings, a Mallard duck ring and a whole range of teacup pieces. Quirky and cute come together perfectly in all her designs. Living in T-shirts and jeans won't ever be a problem if you have statement jewelry like LASJ to go with it. Your online destination for "random pretty things" and glittery fun baubles! (r-ki-tekt) necklaces, belts, and hair accessories are perfect for brightening up anyone's day. On top of the confetti and glitter (r-ki-tekt) features a healthy dose of polka dots that even the most boring person you know can't refuse. And honestly a shop that's main inspiration is Punky Brewster doesn't need explaining so I'll just let these random pretty pieces speak for themselves. I love flowers and putting them in a pretty vase is the icing on the cake when it comes to the aesthetics of bouquets. The fact that LOVESTAR vases are heart shaped and made to be mounted on your wall already makes them super cute. Add in glitter and sparkles with "All You Need Is Love" printed on the front in gold foil you have the cutest flower arrangements you could possibly imagine. CeleneStones is one of my favorite Instagram shops and uses some of the pretties druzy stones and shiny beads for its wire wrapped bauble bangles. CeleneStones bracelets and necklaces are overflowing with pinks, blues, purples, and whites -- the best colors for creating a pretty princess jewelry piece. Another item on my Rich Girl Wishlist, Party Skirts are just what its name implies: skirts that work fabulously as party attire. They collaborated with Teen Vogue earlier this year to make poofy party skirts in polka dot and plaid patterns. The newest designs are just as party-worthy as ever and the new Party Skirts tee shirt line has super cheeky, fun tees that can be worn casually or a little dressed up. Party Skirts were made to be worn with Sophia Webster shoes so that every girl who ever wears a pretty princess outfit can strut her stuff in head to toe style. Today is the 150th day of my 101 in 1001 challenge and I think it's time for an official check up. For any of you newer readers, in the beginning of March I decided to make a list of 101 things to do in 1001 days. I created a 101 in 1001 page (which you can find in the tabs at the top of A Glamorous Revelation's homepage) for my list and I'm crossing off everything I accomplish as I go. It's also almost 7 months from the beginning of the year when I made my New Year resolutions. This year I only had three things on my list -- get organized, do things I enjoy more often, and let go and let God -- and each one has been done throughout the year. Continuing to stick to my New Year resolution list has become much easier now that I know how much better my life is when I follow it. I have so many bucket lists going at a time (New Year resolutions, 101 in 1001, Summer 2k14 bucket list, and 1 Year Anniversary blog bucket list), but I want to unofficial add two more items to my 101 in 1001. I still have over 800 days to get everything done so I'm not stressing about completing everything, but I felt that they needed to be added because they are truly things I want to do within the next 2 years. I'd really love to attend Teen Vogue University. The $250 weekend trip includes seminars and classes taught by some of the fashion's most influential people. It's held around Fall Break weekend every year and it's in New York so I plan to go my freshman or sophomore year of college to go even deeper into the fashion industry and have the chance to explore The Big Apple. I want to make blogging my main source of income. Of course I would love to be a full time blogger but I'll be a full time student for the next several years and I get excited when I think of myself years down the road fully immersed in my blog while I'm going to school. Maybe my expectations are too high, but I can totally see myself juggling the school life/blogger life routine everyday and loving it. July has probably been my favorite and least favorite month this year so far. I spent quality time with my blog expanding it's reach and planning a lot of exciting things for the coming weeks and I'm super excited to share them with you guys. But July is also the beginning of the end for a lot of things in my everyday life. Today marks the first day back at school for me (year round schooling can be a pain sometimes!) and this coming school year is going to be difficult with me working more, blogging more, and taking even more classes than before. I am going to embrace the challenge this semester will hold but I can already feel that great things are going to happen. So as an ode to the end of a great summer vacation here are the Instagram posts I loved this month. @thejarshoppe: This new hair tie set from The Jar Shoppe is my favorite from their new releases. The lavender foil on grey background and sparkly grey look just as cute on your wrist as they do on your hair. @oliveandjune: I am going to be trying this manicure in the near future. Super simple but fun and it'll adds a little brightness to my day. @shopbando: The Ban.do team released this months survival guide and these are the items that made the list. If you're ever trapped on an island with the Girl Gang and a genie grants you one wish, wish for these items. @brooklynblonde1: I want a closet this size for my basic clothing. And the little trunks on the side remind me of a European escapade. I'm not quite sure why, though. All I know is that if and when I study abroad I'm going to be using cute little trunks like these. @melbourne_fashion_style: These Alexander McQueen boots... I can't say I'd actually wear them if I had them but they are a piece of shoe eye candy. Especially those suede laces. @modcloth: Pinterest has many different tutorials on decorating clothes pins and there are little shops all over Etsy selling bedazzled versions. I've never really been interested until I saw these circus people ones from Modcloth. Happy Friday, Lovelies! My opinion piece "Dethroning Vogue Magazine" was chosen for this weeks Links a la Mode and I am so excited. I've been wanting to get down and dirty with Vogue Magazine since almost the beginning of my blogging days and I even have "admit I don't like Vogue" on my 101 in 1001 bucket list. There are so many things in the fashion industry that we feel almost obligated to like, if not love, because fashion insiders and the prominent voices behind the industry tell us to. Glamour Girls redefine the standards and are honest and real with themselves and life. I want to challenge you to really look at what you love in the fashion industry and distinguish between a product you're being sold or a product you're genuinely falling in love with. There are several other posts selected this week that are a great read that confront so many standards in the fashion world and I love that these girls aren't afraid to speak out. One of my favorites is "3 Times You Don't Need Makeup" by Anonymous Beauty Blogger. This week we're getting ahead of the trends by, you guessed it, indulging in hair accessories. Head scarves, headwear, heck, even jewelry. Maybe you're taking the lax look to a whole new level, and try to wear sweatpants to work? Oh yeah, there's that too! So, don't fall behind, read this week's fantastic roundup! Lollieshopping: What does "Bargain" mean anyway? Stilettosaurus: What's in a blog name? One piece outfits make getting ready in seconds the easiest thing for the perpetually late woman. Slipping a single piece of clothe on and looking glamorous is the ideal situation for the average Glamour Girl in the mornings. Pinterest is nothing short of a one piece outfit inspiration board in all mediums: dresses, rompers, swimwear, and lingerie. A little slinky dress or a strapless ombre maxi look stunning as the sole piece of an outfit and a romper nightgown is a chic alternative to the typical lace slip. Even though we're well into the summer season there are still several warm weekends left to spend laying by the pool or gallivanting on the beach. A one piece swimsuit allows for a stylish outfit without feeling overexposed or super self conscious. Take a hint from the 50's and go for a mix and match pattern/solid with a faux high waisted design and you can't not look fabulous out by the water. And for special evenings out studded and bejeweled gowns are the perfect option because who doesn't love feeling like they're dripping in diamonds. For more inspiration visit my "One Pieces" Pinterest board and to see all the different pins featured in this series follow me on Pinterest. I am incredibly indecisive with my nails. I change nail polishes 2-3 times a week and experiment with nail art all the time so at home DIY manicures are a must for me. Essie has over 250 different nail polishes and colors so you're never without a shade that fits your mood, but sometimes a manicure needs more than just a few coats of a single color. Nail jewelry, nail art pens, shell and caviar decals, and custom named polishes are what you need to take your nails to the next level and these brands have just what you need to make it happen. 1. Who doesn't love all of the puny sassy nail polish names you find on the bottom of your nail polish bottles?! Pretty Please Nail Polish has an easy to use custom nail polish generator that makes creating your personalized polish super easy. First you choose one of the 25 colors they have for the season. Then you choose the name you'd like it to have. It can be anything you can think of within 25 characters and will be placed right on the front of the bottle. Next you can pick another shade and make another custom nail polish or decide to order more than one of your first creation to add to your shopping cart. Once you have created all the personalized polishes your heart desires place your order and viola! You're now an official nail polish namer. Add that to your resume! 2. Nail wraps have all the intense detail and design of a professional manicure but take out all of the time and skills you need to get it done. They are super easy to use and the best part about them is their is ABSOLUTELY NO DRY TIME. My least favorite part of doing my nails is the inevitable helpless hands syndrome when my nails are wet and I have to walk around with my hands out in front of me like a zombie. Scratch Nail Subscriptions make nail wraps even easier than before with a monthly box of nail wraps custom designed by their artist of the month. Each month you can sign up to receive each months box, but don't worry about getting a bunch of nail designs you don't like. Before each set is sent out for the month they send you a preview email so you can decide if "yes I want to receive this month's box," "no, I'd like to skip this month's box," or "I want to send this months box to a friend" and if you skip a month it's at no cost to you. 3. Decals and 3D add-ons can instantly make your nails look like they took hours to do, but in reality they just take a dab of nail glue and a pair of tweezers. Hex Nail Jewelry has dozens of different 3D nail decals you can buy individually or in sets. The simple gold plated designs give your nails a classy rather than cartoon-ish vibe so you don't have to worry about the "professionalism" look. 4. Not only are Ciate Nail Polish bottles super cute they come in sets that make even the most insane ideas nail art genius. Their newest release is the seashell manicure which has a base coat color and a bottle of finely crushed shells in a complimentary shade. Ciate is also the home of the caviar manicure and every year they release new caviar bead colors and a caviar mini nail bar set. And it doesn't stop their! Remember my chalkboard nails from a few weeks ago? Yep, those were Ciate. And the nail decals everyone is talking about that are made from real flowers? Those are Ciate, too. They've got nail kits on lock so keep a look out for their new releases in Sephora and on their Instagram. A good agenda is hard to come by. Everyone has their own little requests when it comes to what they want in a planner. Some people love tabs and monthly views between every section, others like a spiral binding or an elastic closure to hold everything together. There are those who like the sleek and professional look while others prefer cute and fun designs. For almost every different quirk and request there's a brand out there that caters to your very needs but finding the right one can be more of a fuss than its worth. So here are the little details to consider when buying a planner and the brand that fits your requests. First things first determine your size preference. Do you like a planner about the size of a standard letter or do you prefer a more compact option that you can carry around in your purse for day-to-day activities. Lilly Pulitzer offers a range of sizes in her signature bright colored prints. If you love Lilly patterns and want to be able to choose from a variety of size options then a Lilly Pulitzer agenda is the way to go. Next you need to know how you would like the design to be. Kate Spade releases new agendas every year that have a spiral binding with a hardback covering for a more professional feel. The inside script and layout is minimalistic and features simple monthly and weekly views. Even if you prefer a sleek look but like a little fun and color the 2015 Kate Spade agenda covers come in black and white stripes, green ikat, gold foil polka dots, and a watercolor bookshelf. Plus they all have an elastic band closer so all of the papers and notes you put in the front cover won't slide out when you're in a rush leaving the office or going to class. Lastly you have to decide which little details you'd like your agenda to have. Some planners feature super cute monthly illustrations, funky sticker pages, and special holidays marked throughout the year so choosing what you want most can be difficult. For an overall fun planner Ban.do agendas feature all of the above as well as fun little words of encouragement (like "you are better than unicorns and sparkles combined"), weekend plan suggestions (like dying your hair pink or creating an inspiration board), and an inside accordion pocket to keep all of your little notes and things. To top it all off, they are just the right size to fit into your purse or bag without being swallowed by all of the things inside or taking up too much space. So which agenda is perfect for you? 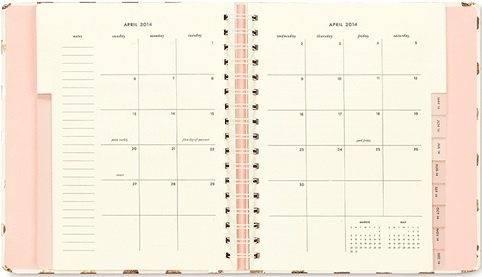 Let me know in the comments section which one's your favorite and what you look for in a planner. This year I went for the Ban.do agenda with the "I Am Very Busy" cover and I love it. I seriously can't wait for August 1st! This month is flying by so quickly it barely feels like July even happened. Keeping my mind on June rather than the end of this month (who came up with the idea of starting school in July anyway?!?!) with all of the internet posts I loved makes summer vacation seem just a little bit longer. Here's to ending Summer 2014 with a bang! Pearls and Pastries: Like I said last week, Lauren knows how to bring on the pretty, pink, and sparkly. Her weekly treasures have some of the cutest things including this watercolor feather painting and a gold trophy bowl filled with confetti. Fashion Indie: Willabelle's closet is to die for! Cheetah print espadrilles, blazers in different shades of pink and blue, wedges with barbie heads in them, and a rack of faux fur coats. She has a glamorous wardrobe to say the least. Instagram: @Refinery29 posted this pic of Kelly Osbourne with her lavender grey hair braided and accessorized with giant safety pins. A bit reminiscent of her quite dark, figuratively and literally, days before she embraced her style savvy position in the industry. I've heard a lot about Diptyque candles and have seen them in pictures on almost every frills and feathers fashion blog I've read including Cupcakes and Cashmere. They have a range of scents and sizes, but when I visited their website and realized they cost $65 for the same amount of wax I buy for $1.97 at Walmart I let go of my desire to have one decorate my humble living area. Macarons and Peonies came to my rescue with a 5x7 print featuring 3 Diptyque candles in either J'adore, L'amour, or Baies. For a little less than five American dollars (she's based in Canada) I got the look I wanted without spending the fortune I didn't have. Even the mini Diptyque I have thanks to Hautelook's daily discount notifications doesn't stack up to my J'adore print sitting pretty atop my bookshelf. Pinterest is full of complex recipes and 30 minute dishes but as someone who isn't the best chef I just love to look at all the beautiful food. Gourmet burgers and almost anything on a stick has me drooling. All of the fabulous Susie Homemaker pinners never fail to supply me with pretty, pink donuts sprinkled with gold and lavender confetti and chocolate drizzled popcorn planted on top of an ice cream cone. And who doesn't love Rocky road cookies and blueberry waffle cookie bites? I try to make ever meal an occasion and take every thing to the next level. A fancy meal doesn't have to be at an expensive restaurant or include a lace tablecloth and wine glasses. Even with the small, seemingly insignificant meals I try to through in a little pizazz inspired by all of the deliciously photographed foods on Pinterest. When food looks just as good as it tastes it makes me fee that much more glamorous. You can find the recipes to all of these dishes on my Pinterest board "Food For Thought" along with all of the other pins seen in the series Pinspiration. I have an unashamed, unexpected love for Leandra and Co over at The Man Repeller with all the satirical, buzz-worthy, and plain ridiculous articles they publish every day. Incidentally finding blogs that have its same je ne sais quoi in every article while still remaining undoubtedly original and entertaining has become my saving grace. 90% of the most entertaining and thought-provoking pieces I read every day come from edgy and humorous blogs that have a whole lot of fashion and even more personality. So for all of you Man Repeller fans, here are the 3 blogs you should be adding to your reading list. By far, one of my favorite blogs simply because Tarah writes about the inside of the fashion industry rather than just it's pretty surface. Some of her best posts talk about why you should (or shouldn't) be wearing makeup, the fabulous stylists behind Lupita Nyong'o, Lily Collins, and Zendaya, and why she cares way more about fashion than she ever will about politics. Okay there is a little bias here because Sarah, like myself, is a lover of unicorns. But all personal preferences aside, her blog has a humor that's effectively subtle at times and outrageously sarcastic at others. Even her outfit posts feature her hanging from stop signs and playing with bunnies. One of my all time favorite posts on Loser Girl Wins discusses why she reads Seventeen Magazine past the quite obviously suggested age of 17. Her answer in a nutshell: Teenagers are broke, she's broke, and Seventeen features cheap products so why not indulge in its suggested items. The Blonde Salad is one of the most popular fashion blogs in the world and features a collection of high fashion outfits and inspirational photos from Chiara Ferragni as she prances around Italy. Her incredibly expensive and artfully worn outfits match the aesthetic of Leandra and her $1,000 mules and neck scarves. The most Man Repeller-esqu part of The Blonde Salad is Chiara's inspirational photos that she posts every week. Most all of them look like they've been torn straight out of Love Magazine or an early 2000s issue of Nylon. Despite Chiara's blonde hair and beautiful Italian face she has a slightly 90's rebellious style that only a true Man Repeller lover can appreciate. I do not wear denim cutoff shorts nor do I plan to any time in the future. Cutoffs seem to be some sort of unspoken summer essential (I know I've never actually seen them on a Summer Essentials edit) and I have no clue why. They don't offer much style variety beyond what you find in average, ankle length denim and they are by no means convenient. More often than not their pockets serve no actual function beyond hanging below the uneven and distressed fringe that itself is so inconveniently placed. What if you're having such a good time that your phone can no longer be held in your hand but must find residence elsewhere? Or if in your haste to leave your house the oh-so fashionable fringe hanging from your shorts gets caught on the door knob? These things happen, people. So what do you do? My advice is you stop wearing denim cutoffs and replace them with these 11 pairs of shorts that make Summer Lovin' more than just a song in Grease.